Do you want to spend an intimate afternoon in a dark room with some strangers? How intimate do you want to get? Try deep under somebody’s skin. Literally. Body Worlds is a controversial, world-travelling exhibit that features real dead humans transformed into solid, non-decomposing anatomy specimens. Over twenty-eight million people across the world have visited it since 1995. 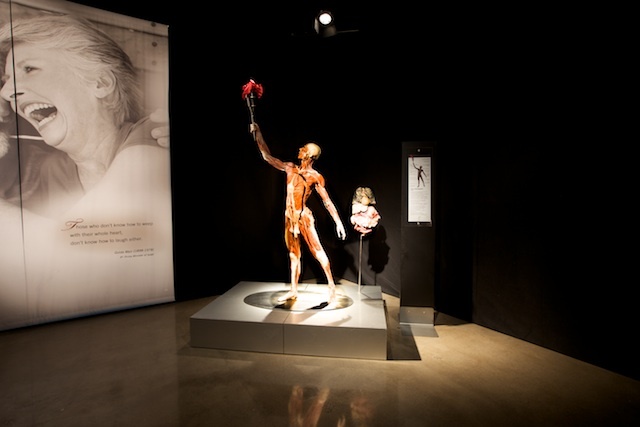 The latest incarnation, Body Worlds and The Story of the Heart, begins today (October 9) at the Ontario Science Centre. The aim of this one is to “reveal through the lenses of anatomy, cardiology, psychology and culture how the heart nourishes, regulates and sustains life.” It’s the show’s second visit to Toronto, and none of the specimens on display have ever been shown here before. 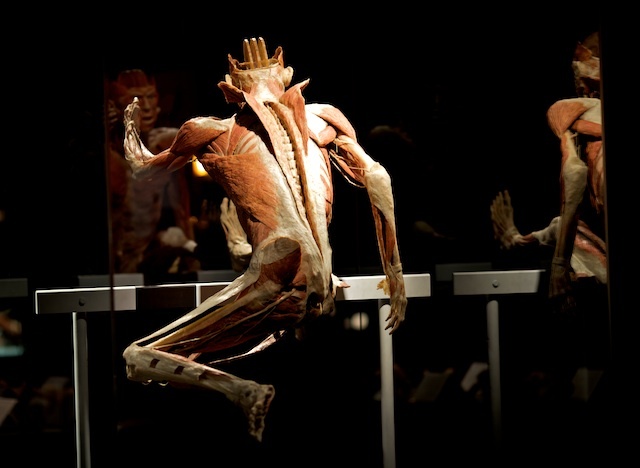 All the bodies and parts on display have been treated with a process called plastination, invented by German anatomist Dr. Gunther von Hagens. You can read all about how plastination was invented here. The exhibit in the Ontario Science Centre has been set up to gently ease you into the, erm, flesh and bones of dead bodies on display. The first thing you see is a disembodied, scarlet human heart, suspended in a display case. A soft heartbeat plays in the background. In other cases, blood vessels in the shape of a spine resemble the pepper you can’t quite scrape off your plate at Turtle Jacks. Skeletons hang on the wall, like they did in your biology class. Arguably the most impressive thing here is “The Archer.” Crouching on a pedestal, she wears her brain like a ponytail bun. Her arms are stripped to the bone and her head is swollen like Morbo the News Monster. This is “to show as much anatomy as possible”…says the text panel. As well as figure-skaters and archers, there are javelin throwers, gymnasts, and hurdlers. But the previous owners of the cadavers are unlikely to have played any of these sports while alive. The bodies are posed; at the first Body Worlds exhibition in Japan in 1995, the specimens were left lying down. The patrons complained that they looked too dead. Both Dr. Whalley and Lesley Lewis, CEO of the Ontario Science Centre, were at pains to point out that all the specimens in the exhibit had been donated with permission of the owners while alive. Most of the bodies on display had been donated by people in Germany, but there is growing interest in plastination in North America. Out of the one thousand people who have promised their future cadavers to the Body Worlds exhibit, seventy are Canadian. The average age of the bodies on display was fifty to sixty years old, explained Dr. Whalley. “We have quite a lot of young people in the files, but it is a long time before we can receive them,” she said. The donors are always anonymous. People donate their bodies for many reasons—because they don’t like funerals, or to further the advancement of science. Part of it is health education, too. There are likely to be at least a couple of people from Toronto among those seventy Canadians donating their flesh and bones to the Institute for Plastination. And there might be several more after the exhibition moves on: you can sign up to donate at the end. If you want to look your best, you’d better get practicing for London 2012. Body Worlds and The Story of the Heart runs through February 2010. More information and tickets are here. All photographs by Christopher Drost/Torontoist.